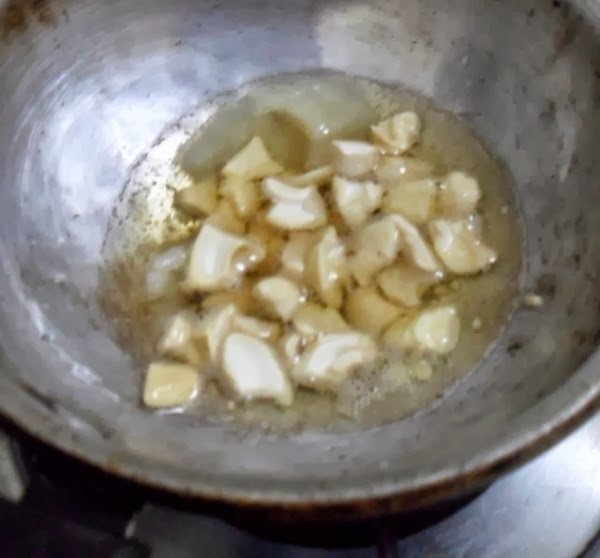 If there was one thing that really made me very happy in doing this ABC Cooking Marathon, is the fact that I attempted at making many of those long pending dishes. Thinking about every letter, made sure I remembered all those dishes I had always wanted to make. One among them was surely this Ukkarai. 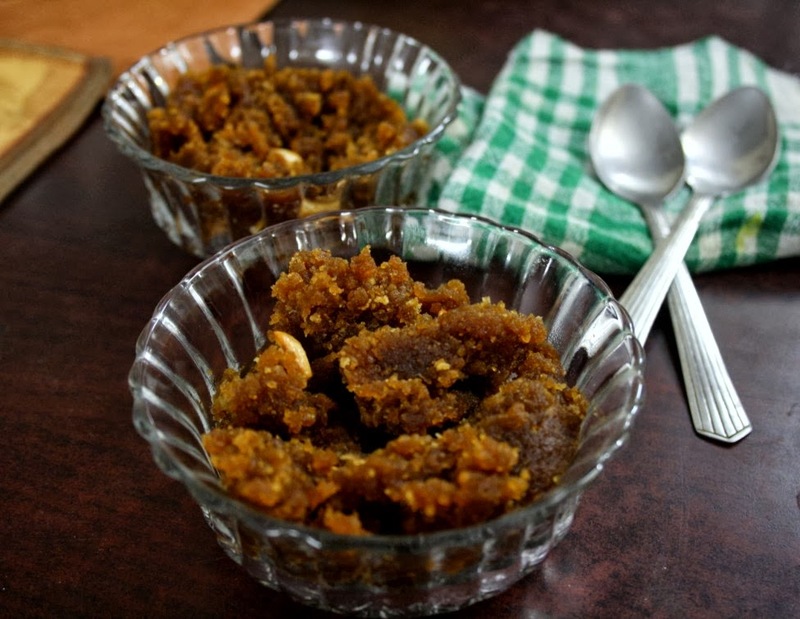 Ukkarai is a sweet that’s quite popular in the Tamil Brahmins Community in Tamil Nadu. Or it might be popular in other communities as well. I am not sure of that. However my exposure to this sweet has been only from my tambrah friends. This is mostly made as one of the Naivedyams for Navarathri. Along with the many lentil Sundals one gets to feast on, this sweet was so uniquely presented. I used to look forward getting this and used to feel shy to ask for another packet. Guess the small packets you are given, makes up for the entire experience of eating this. So it was only natural that I had to search for this when I wanted to attempt at making locally famous dishes from Tamil Nadu. 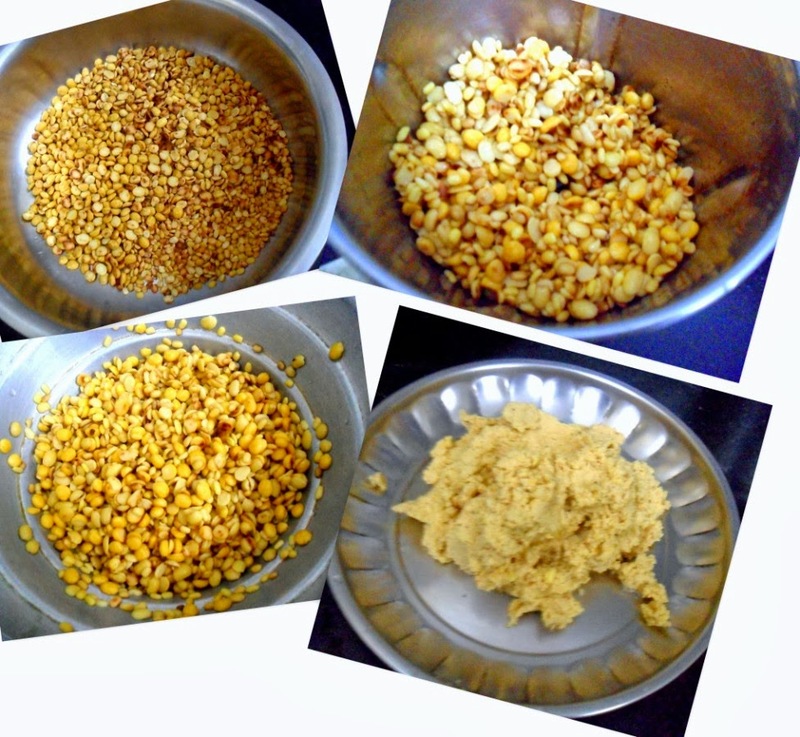 I remember Viji of Vcuisine making it and have ever since bookmarked her recipe. 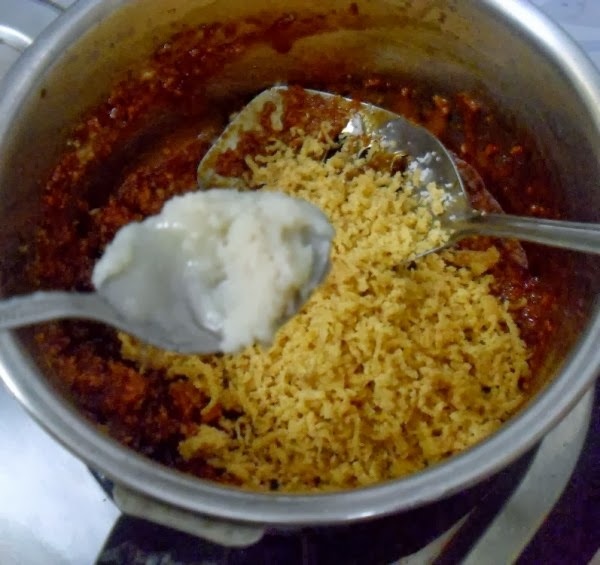 Since I had no clue on what exactly goes into making this dish, and also Amma had no idea about it, I followed the recipe to T, which trust me is very hard for me. Even this I am not sure if I attempted exactly. Viji should be the best judge to this. Anyway this was one of the most loved dish, not just for the taste, texture, the aroma that came out of the kitchen was simply out of the world. 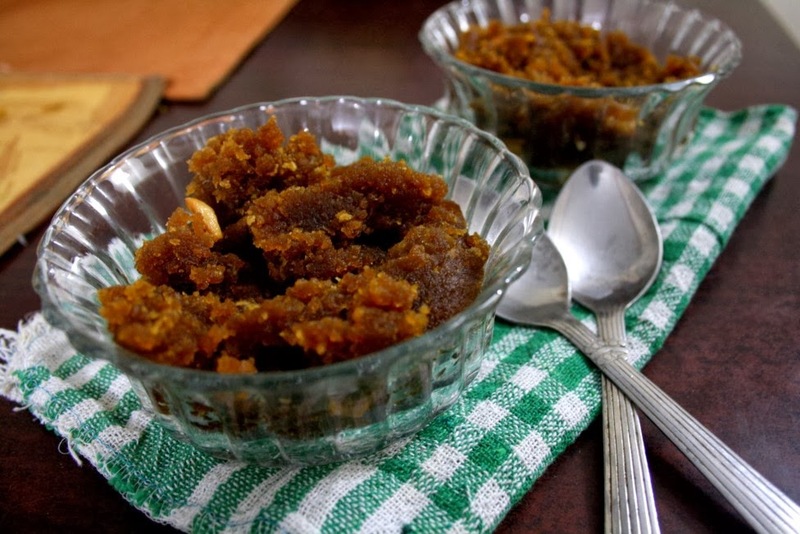 Apart from being loaded with protein, this is quite fattening if you end up adding more ghee. I kept to the minimum as suggested. Yet we felt it was too heavy after couple of servings. Guess as I said, what Maamis offer during the Navarathri, was just enough. The process involved is quite lengthy and you got to excess some elbow power, but trust me the end result is all worth the efforts. This can stay for over a week as well. 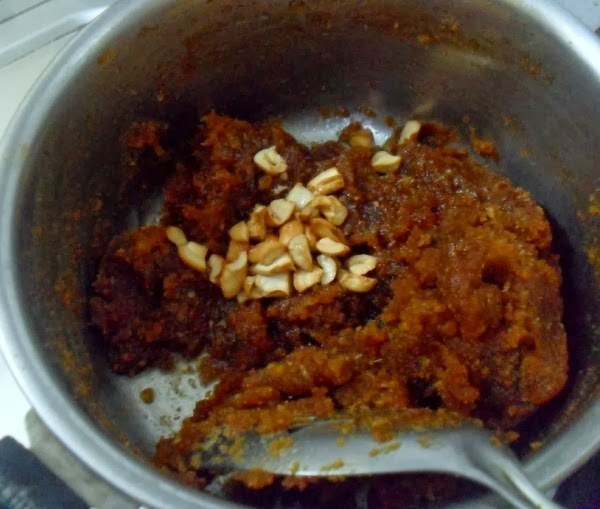 Remove what you want to serve, microwave for a min and voila, you have your delicious halwa again. Maybe I can’t exactly term this as halwa. 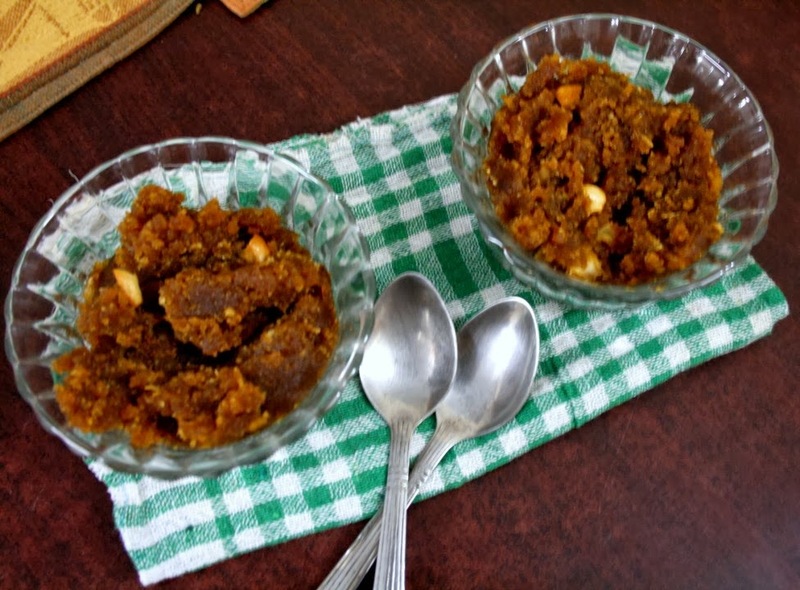 But then it does taste almost like the Moong Dal halwa or any halwa that you make with dal. Recently I had a conversation with Ganga of Vegeyum. She wanted to know what was Paruppu Puttu, as said by Meenakshi Ammal. I knew paruppu puttu was more of a sweet. However MA seems to have referred regular Vegetable Usli as this as well. Well if she has said maybe it must be true as well. Can’t dispute with a great cook like her. Though I told Ganga that these names and references could change among different communities as well. Steamed as balls for 15 mins. Then grated to a fine pieces. In a non stick pan, dry roast the dals separately. Once they are roasted well, remove and cool. 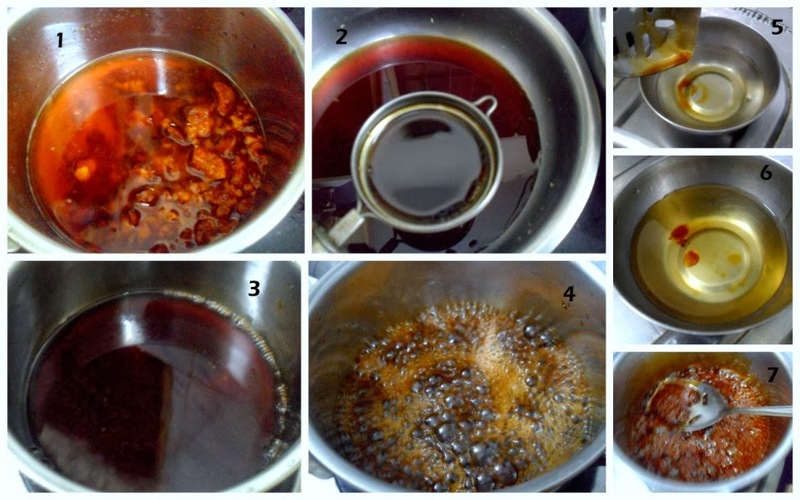 Then wash and soak in water for 2 -3 hours. Drain the water and leave it in colander for at least 30 minutes. Grind it in the grinder without adding water. 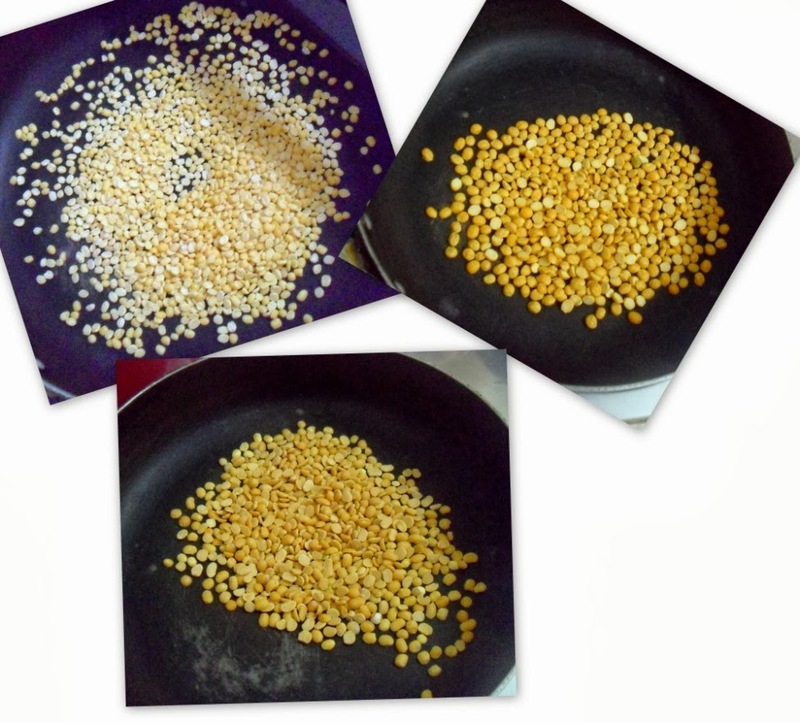 The dal need not be very smooth but not very grainy too, more like the dal mix you make for Usli. When you touch the batter it will not stick to your hand. 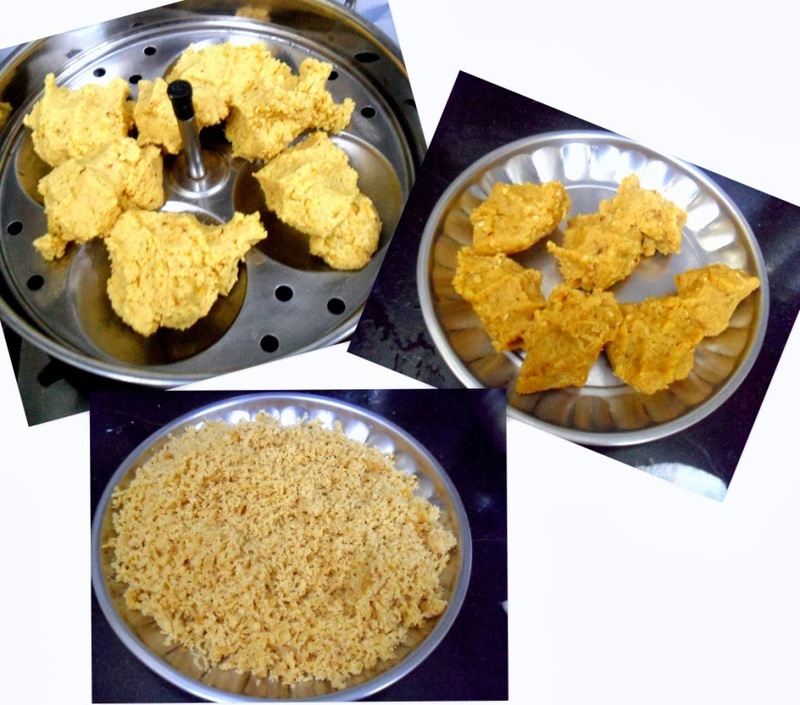 Remove it and steam cook this batter in the idli plates for about 12-15 minutes. Let it cool. Then grate into fine pieces. 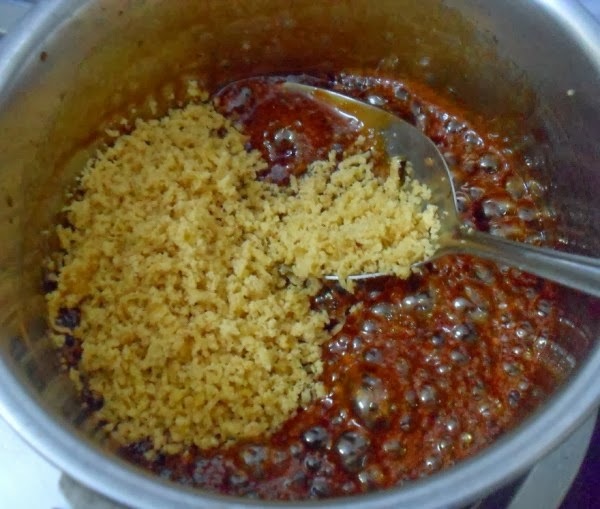 In 1 tsp ghee, roast the cashews first then roast the grated coconut till golden brown. Keep it aside. 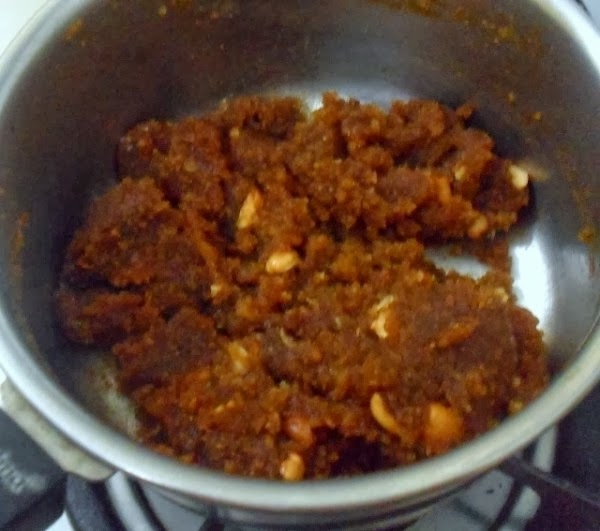 Now take a thick bottom vessel and boil the jaggery with 1/2 cup of water. Strain for impurities. Leave it to boil again till you reach soft ball consistency. When you drop the syrup in 1 tsp water, you must be able to form a soft ball. 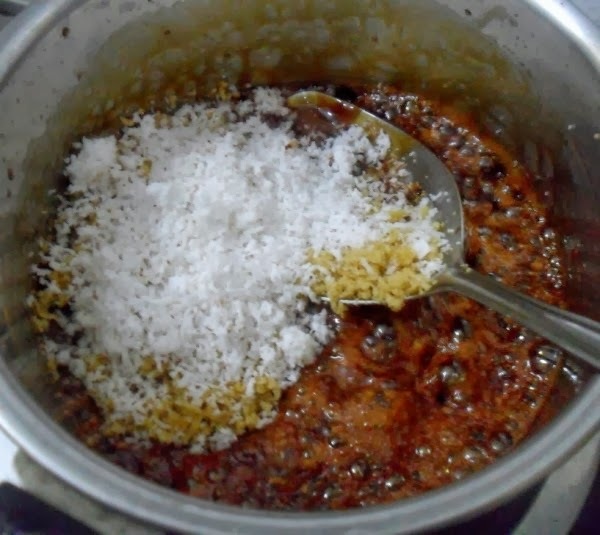 At this stage, add the cardamon powder, coconut and the grated steamed batter. Mix well adding ghee in instalments. As the batter is already steam cooked, it may not take more than 3-4 minutes. Keep stirring to ensure it doesn’t brown at the bottom. Adding ghee a tsp at a time, makes sure you don’t add too much. I added only about 2 tbsp. If you want more ghee you can always add it. Absolutely love this traditional dish. I tried it after seeing in Gayathri's blog. wow thats a new sweet to me 🙂 looks super delicious and very healthy one !! wow what a recipe so nice valli mom always talks abt similar recipe like this never attempted.This one is just yumm and tempting to try.Def bookmarking it. Ohh this is called as paruppu puttu I didn't know that But realy a healthy sweet.. Such a wonderful and traditional recipe. I am sure it will taste heavenly. A lot of work but these sort of sweets make it worth. I will do this for Deepavali. Anyways it surely sounds delicious and healthy too.. Such an authentic dish, would love to get a bowl rite now..Makes me drool. wow Okkarai is a traditional one and you have made it soo good!! had taken up this same dish at fist for U , valli. But the ghee in that was a deterrent 🙂 I see here it cud have been with a lot less ghee than I fathomed.. Sounds so authentic. Have never tasted it but can imagine the divine taste! Absolutely traditional and healthy for kiddos or adult both. My MIL makes this every year for Diwali. It is a must for Diwali for Tambrams in TN I believe. My MIL's is a bit more powdery/dry than what you have here and it stays good for over a week. I agree with you about the aroma…the house smells heavenly with all these yummy flavors! Looks very delicious Valli. this resembles the paasi paruppu puttu served in chettinad functions.